2/35: Seasons in the Sun view from the road. This large home has so much to offer. 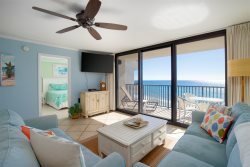 Seasons in the Sun is located in the Blue Mountain area of 30A, a family oriented community with a laid back feel. Its beautiful white beaches and friendly atmosphere will make you want to return time and time again. This 4 bedroom, 3 bath home has undergone a total renovation. The open floor plan makes this the perfect house for your family gatherings. Three bedrooms are on the main level with the 4th bedroom on the ground floor utilizing a separate entrance. You will enjoy the brand new heated pool and hot tub or relaxing on the large screened-in deck equipped with comfy furniture. The yard is large with room for kids to run and play. The kitchen, featuring all new appliances, is fully stocked with ample cookware, coffee maker, microwave, toaster, and blender. Each bedroom is equipped with flat screen tv’s and comfortable bedding. Don’t worry about bringing a Pack-n-Play or highchair. We thought of that for you. Seasons in the Sun’s very desirable location means a short 2 minute walk to the powdery white sand beach and is close to everything but on a very peaceful and quiet street. Beach access is through Gulfview Heights. Gulfview Heights Access has parking, restrooms, showers, picnic tables with shelter, and lifeguards during peak season. Nearby, you will find many favorite local restaurants: Goatfeathers with local seafood market or Local Catch Bar and Grill on 30A serves fresh Southern style seafood daily. One of our favorites is Sally’s by the Sea, only 1.5 miles away and are known for their Famous Breakfast Sausage Biscuits. Burgers and fries are tasty. And, she serves a variety of other things at lunch. The homemade pimento cheese and homemade chicken salad are an easy pick up for taking to the beach. There are a host of other great restaurants within a 5 minute car ride. Walk or bike less than 1/2 mile to Gulf Place shopping center for more restaurants, shopping and the 30A store. This bike path, just around the corner, called The Timpoochee Trail, connects all of the communities along Hwy 30A including Seaside, Watercolor, Grayton Beach. Need a bike? This rental comes with 4 bikes and a pull along carriage. Lots of fun!! If you love nature, you are right next to Draper Lake Preserve which spills into the ocean between sand dunes. This shallow water makes a fun area where young children can meet other young children and play creating memories for years to come. Your team was amazing. Every problem that came up, they were quick to get resolved. They made me feel like they cared about my stay. You don't get that a lot anymore. It was refreshing and made our stay that more enjoyable. The property was fabulous. The pool and hot tub were wonderful and warm. The kitchen was large enough for our party to enjoy. We all comfortably enjoyed the living area. There was enough space for all of us. The master bedroom shower was amazing! With the bikes provided by the property, we were able to get down to the beach quickly. Wonderful area as well!